We all know that you are what you eat, and that what goes into your body must come out, for better or worse, right? Well, the same goes for your consumption and what goes into your home and what comes out. What you bring into your home effects the state of your home. If you are cleaning with highly toxic chemicals, then you are breathing in all of those toxic chemicals on a daily basis. If you are buying new products everyday to fill your home, then you need to find a place for all of those things, and clean and care for those things. Even if you cut back on what you consume, what about all of the "essential" items you buy? Clothes, food, toiletries. They come into your home and go back out in some form. If you buy a bunch of bananas, you have the peels left over. If you buy shampoo, you have the bottle when you are done. So what do you do with these things? Do they all end up in the trashcan and then to the dumpster and then landfill? They have to go somewhere right? And what a footprint we are leaving if we just consume and dispose! Because disposable isn't really disposable is it? Everything ends up somewhere! So, want to reduce your load and lighten your footprint? All while helping the environment and our future? Well then read on and learn how to take the steps to Go ZERO WASTE! 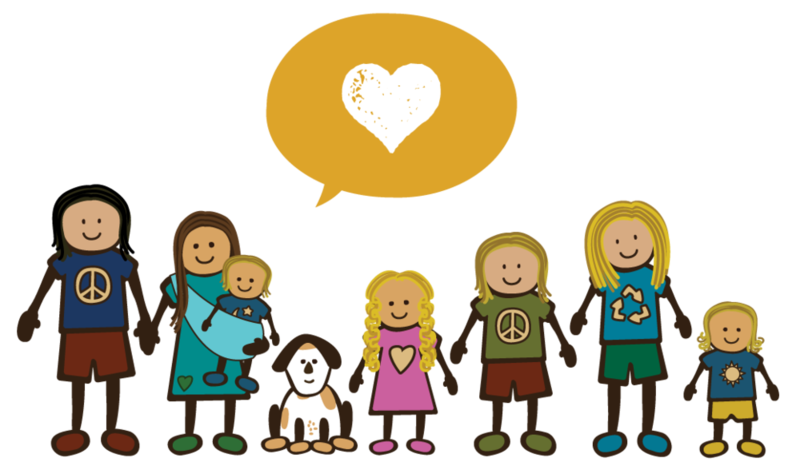 Go ZERO WASTE with the Zero Waste Family Project! 1) Reduce - Try and reduce what you bring into your home. Don't buy something unless it has a place, reduce the packaging on the items you do buy. Buy one large bag of chips rather than single packs all wrapped up individually. And, remember the more you consume, the more stuff you have to take care of and clean and store. 2) Reuse - Then make sure to reuse what you do bring into your home. Our absolute everyday item that we reuse is our reusable water bottles from Klean Kanteen. They are durable, functional, and a neccesity as they hold our water source for our family on a daily basis. We use them at home and definitely when out and about. We often fill up extra, as well, to make sure we can refill everyone's bottles if necessary so that we don't ever have to buy water, support plastic water bottle companies, or stop to find water when running errands. And, if we are on a hike and run out, we bring water filters to source from nature. We can't go a day without our Klean Kanteens! Also, check out consignment and thrift shops, you are essentially reusing someone else's discards, giving a product a longer shelf life. See you are helping the product live longer! And, when you are done with an item that you have consumed, pass it along. Some people's trash is another's treasure! Also be aware of how an item can be repurposed. An old t-shirt with stains can be turned into a rag, old jewelry can make a new barrette, an old toy can be taken apart and its pieces can be used for an art project. There are also some awesome ways to upcycle clothing into something new and fabulous from pieces of old clothing given new life and a funky edge. 3) Recycle - And, when you have reduced, reused, and repurposed everything you can, recycle whatever can be recycled. This will vary from location to location, but most communities at least recycle aluminum, glass, and #1 and #2 plastics. If you can recycle paper, cardboard, and all other plastics then do so! Or, if your community doesn't offer to recycle everything, but a neighboring town does, or your local market or store does, take your things there. You will be saving money if you have to pay to take things to a local dump or for local trash pick-up, and it really doesn't take that much more effort once you know where everything goes. Also, remember that plastic bags can even be recycled, with drop-off bins often at the front of most grocery stores. In some locations, you can even take your bottles to local Redemption Centers to be redeemed for cash! And, you can also use paper or cardboard (or bills) to light a campfire, often serving a dual purpose for being a great release of energy into the flame. Be sure to check http://earth911.com/ for more information on just what can be recycled, and where to take things like automotive or hazardous waste, electronics, batteries, etc. But even if you don't commit to recycling everything and carrying it with you or storing it until it can be, then at least recycle what can be recycled where you are. You are helping keep items out of landfills, and learning that every thing has a life, from cradle to grave, trash just doesn't disappear. *Take those steps first, the three R's, and just remember that every thing needs a place. It comes from somewhere and ends up somewhere, so be aware of its life cycle. If you are already doing all of the above, do you compost, as well? 4) Compost - Food scraps often get thrown in a trash bag and tossed into the dumpster along with everything else. But, did you know that it only takes a few weeks for most food to biodegrade back into the earth and become soil. And, if that same food is left inside a plastic trash bag, then it won't biodegrade at all! Imagine all of the food sitting somewhere inside bags in a landfill. That's a lot of waste! So, the next step you can take to go Zero Waste is to compost. We keep an inside container with a cover and dump all food scraps and any recycled paper products that may have food on it into this container until it is full. Once full, we take it outside and dump into a three gallon bucket with a lid. There are also compost containers that you can buy that spin for you, and compost containers that you can make by simply drilling holes in a plastic storage tote. Or, if you have an open space in your yard, just designate a place to start dumping your compost, or just dig a hole. And, yes, we even compost on the road. In most places, we never have animals get into it, but do have bungee cords to secure the lid just in case, and carry this outside compost bucket on our bike rack so it is always stored outside. When it gets full, we find a local nature center, school, farm, or friends's house to take it to and add to their compost, which they usually love and welcome us to do so. It is a great way to connect with the local community and learn what they are doing to be sustainable. Or, if there is no place to take it, or you are not comfortable doing so, simply take a walk in the woods with a shovel and dig a hole. Yep, it is that simple. Three gallons of food scraps biodegrades pretty quickly, and if you are digging a hole and then covering with dead leaves or branches, you won't even see it or smell it. We have been asked, what about animals? If you are deep enough into the woods you are just attracting animals to the woods, where they live. Just do not dig close to campsites, homes, or close to any roads or trails, as it might make a mess if an animal digs it up. It is natural food that naturally composts and naturally goes back into the earth to make naturally rich, fertile soil, the way Mama Earth intended it to. *Now, if you already reduce, reuse, recycle, AND compost, you are doing a lot. But, my guess is that you still have trash. You may have a whole lot less trash, but there are just some things that cannot be recycled or composted. And, yes, there is one more step you can take to reduce and even eliminate having any waste! 5) Bottle Brick - That's right, whatever you cannot repurpose, reuse, recycle, or compost, you can bottle brick! You can actually go Zero Waste and have no trash at all! You basically take your waste, true waste, whatever cannot be recycled or composted, make sure it is dry with no food on it, and stuff it into a plastic bottle. You can use any plastic bottle, any size, anything that you can stuff trash inside, like granola bar wrappers, chip bags, the plastic ties on bread bags, odd pieces of broken toys, broken rubber bands, razors, etc. Stuffed tight and full, these bottles become hard. To fill in any remaining air holes, you can add sand with a funnel. 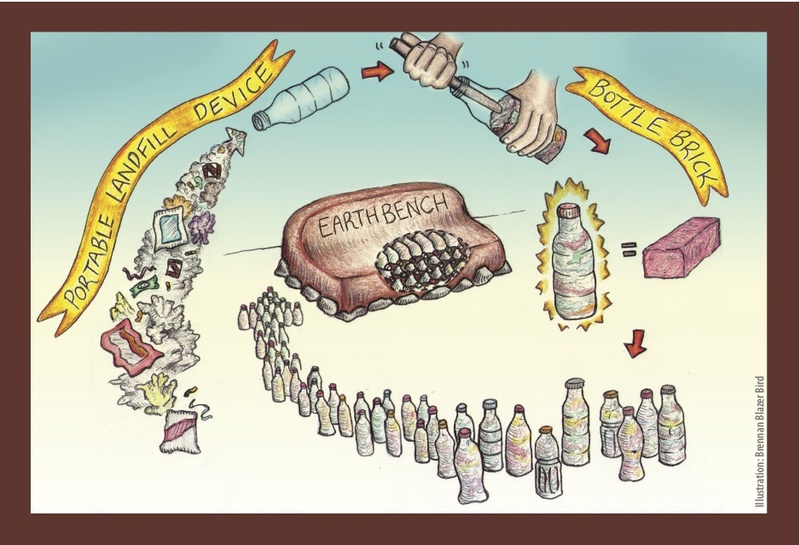 You can easily get a couple weeks worth of trash into these bottles, and it's fun to see who can push the most amount of trash into one bottle. Use a stick or wooden spoon or whatever to do your stuffing, and then place the top back on the bottle. There is no smell, takes up hardly any space, and is just as convenient as a trash can. We keep a current bottle brick on the counter, and have eliminated the need for a trashcan altogether. Now when the kids have trash, they find a recycling container, the compost bucket, or stuff a bottle brick. Who said "trashcan" had to be an everyday word! So, what to do with these said bottle bricks when you have collected a pile of them? Well, send them to us. Yes, seriously. Or look for the many drop-off locations popping up all over the country. We are using these bottle bricks as all natural, FREE, and sturdy building materials for park benches, walls, and schools. Just stack them and use cob (clay, sand, straw and water) or mud or whatever natural building material is available and smooth around the bottles. Yes, that's right. Stuff your trash into a plastic bottle, make it hard as a brick, and then use it as a brick to build something beautiful! At Eco Womb we have joined forces with the Peace on Earthbench Movement to collect bottle bricks, and build community benches all over the country. We are currently developing a list of drop-off locations, but if you are interested, stay in touch with us and let us know you are starting this project with your family. We will make sure to let you know the when, how, and where you can donate your bricks. So go ahead, dedicate the space you kept your trash for a bottle brick instead, you might just agree that storing trash this way is a whole lot cleaner with less smell than having a trash can! Want to learn more, join us in signing up here for the Zero Waste Family Project and take a step toward reducing and even eliminating your trash! Yes, you, too, can go ZERO WASTE!